It’s amazing how the internet can change your life. One minute you’re trying to remember why you felt so sad about that earthworm in your San Francisco backyard, back in 2009. The next you’re all over the front page of the Daily Mirror as a symbol of starving children in Britain. And while you’re basking in all that unlooked-for media attention. The children who could actually do with it are being quietly parked back in front of the wide-screen telly. Out of sight, out of mind. Except when someone wants to have a go at their parents for owning a wide-screen telly in the first place. I have some sympathy for whoever’s responsible for this weird juxtaposition. A tearful Californian child with an article about food banks in the UK. Aside from writing 500+ words a day, one of the most time-consuming aspects of assembling this blog is searching for photos to accompany it. Preferably eye-catching. Hopefully tasteful and appropriate. Containing no images of people who might object. You may have noticed a tendency to fall back on neutral images. Flowers. Trees. Bottles of cheap Shiraz. At least they’re not going to offend anyone. Except maybe an alcoholic with severe hayfever. It breaks my heart to live in a country where food banks are necessary. Frankly it’s a scandal that 330,000 children are dependent on food handouts in an affluent nation like ours. I’ve been volunteering in a community café for almost two years. The local food bank uses the same premises. Two years ago we were able to co-exist comfortably. These days the café has to close early on a Friday afternoon. There’s not room for our customers once the food bank opens. Of course, as Michael Gove pointed out last year, they’ve only got themselves to blame. All these families who can’t manage their money. Nothing to do with having no money to manage in the first place. After all, what right do they have to be sick? Disabled? Unemployed? On low incomes? You thought it was the supermarkets who’d priced your local shop out of existence? Think again. Those pernicious food banks and their irresponsible customers. They’re the ones to blame. How dare people need to eat when their benefits have been sanctioned? Andrew Brown argues that it doesn’t matter whether the photo in today’s Mirror is authentic or not. In a sense he’s right. No photo is going to convey the suffering of 330,000 hungry children. If photos of starving children stirred up compassionate action, global hunger would have been eradicated decades ago. Most of us simply prefer not to see them. The real danger of a sloppy piece of journalism like this is that it actually detracts from the cause it seeks to support. It should have highlighted the scandal of an affluent nation where hunger amongst children is on the increase. Instead, it may well have made us even more wary of believing anything we read in a newspaper. And less likely to respond with empathy in the future. A year or so back, a weary-looking mum came to the food bank. She’d had no money all week. She and her six-year-old daughter had run out of food. I don’t know the ins and outs of their situation. I do know I came face-to-face with a woman who hadn’t eaten for three days so she could give what she had to her child. We made beans on toast for them. I never saw them again. 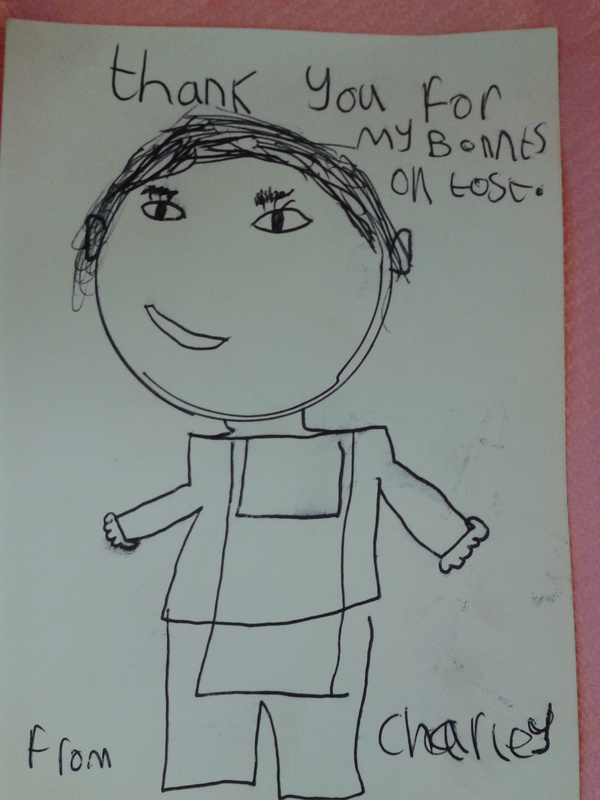 Tonight’s photo is of the thank you note from that little girl. It doesn’t come from California. It has nothing to do with earthworms. I hope and pray that, wherever Charley is now, she’s no longer one of the 330,000.